Vote for Our Blogger's Wedding-Day Makeup! To say I'm clueless when it comes to makeup is an understatement. My daily beauty routine consists of undereye concealer, loose powder, a dab of blush, and a swipe of black mascara. Rather than wear lipstick like an adult, I finish my application with a thin coat of ChapStick. So when I arrived at my makeup trial two weeks ago and Barbara, the makeup artist, asked how I want to look on my wedding day, instead of whipping out a photo of the look I was aiming for, I replied, "Pretty!" She asked me to elaborate and I answered, "Well, I prefer a dark lip, rather than a smoky eye." (I know, very descriptive.) Then, I told her how much I love red lipstick. Insert exaggerated eye roll from all of the other BG brides reading this, who unlike myself, recognize the countless shades of red lipstick that exist in this world. This time, I don't plan on going empty-handed! I gathered some inspirational makeup styles below—would you like to help me out by voting for your favorite? Grace Kelly—a timeless look for a modern-day princess. Red lips and black liner equals a seductive combination. Flushed cheeks and defined lashes are girlie and demure, yet pronounced enough to pop in photos. A neutral eye places all the emphasis on a cherry-red pout. Contoured cheekbones and dramatic lashes up the glamour quotient. Tell us: Which of these looks would you wear on your wedding day? 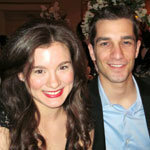 Crista Camerlengo is a real bride and the co-founder of Style She Wrote, who will tie the knot in July 2012 with Michael, her fiancé of six years. This chic NYC couple describes their wedding style as “modern romance"—fitting for a pair who had their first date at a quaint seaport and became engaged in the same spot, overlooking the Brooklyn Bridge. This fashion-forward blogger loves to infuse her traditional taste with unexpected contemporary accents.